The idea of building a mobile wind power station was born in 2005 and over subsequent years this idea was brought to fruition jointly by pupils and teachers. 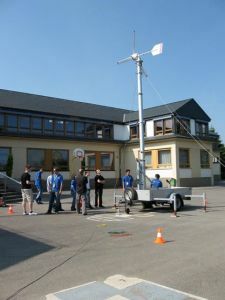 One of the key ideas of the Windmobile project was to build a mobile measuring unit, which could be used to forecast the energy yield of a location. A further – potential future – objective is to deploy the mobile energy source in conflict areas or disaster zones, where it could be used to supply energy to refrigeration units for the purpose of storing medicines. The system’s first prototype was revealed to the public in October 2007. 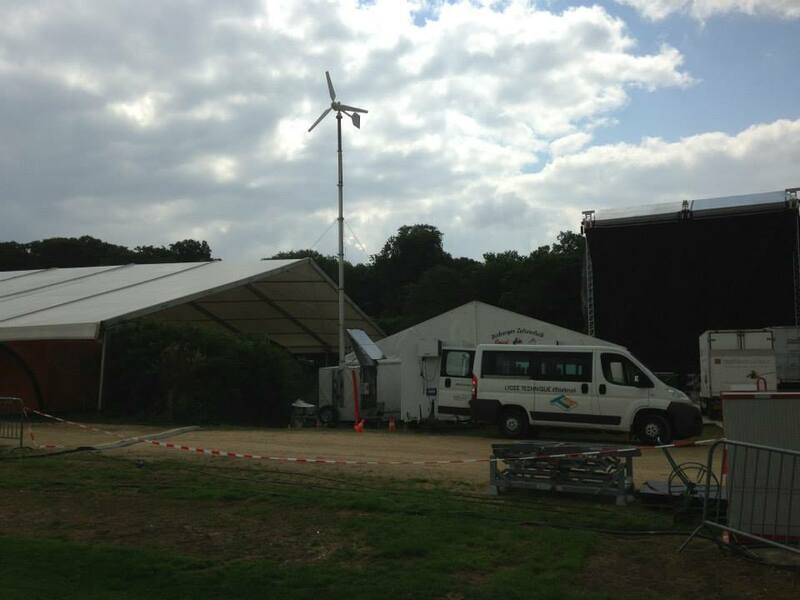 The first prototype consisted of a telescopic mast to which the wind turbine was secured. The telescopic mast was attached to a car trailer and could be extended to a height of almost 11m. For transport purposes, the telescopic mast could be completely retracted into a tilted position, turning the trailer into a compact form of transport. 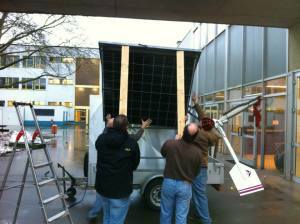 Over the two following years, the mobile wind turbine was enhanced to include a weather station and a measuring device. This allowed local meteorological data to be recorded and if applicable to be compared with the energy yield data of the wind turbine. The measuring device was upgraded allowing data to be measured over a prolonged period of time and wind yield forecasts to be made for a particular location, based on said data. 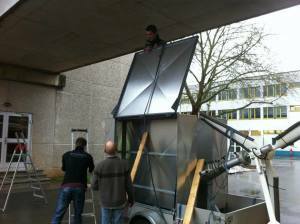 In 2010, the decision was made to provide the mobile wind turbine with a body shell. On the one hand this was necessary to provide the measuring devices with better protection from the weather elements, while on the other hand the remodel meant there were further options for future enhancements. The upgrade involving the body shell construction was in part carried out in the mechanical workshop of Mr Claude Reitz and a Year 4 class. 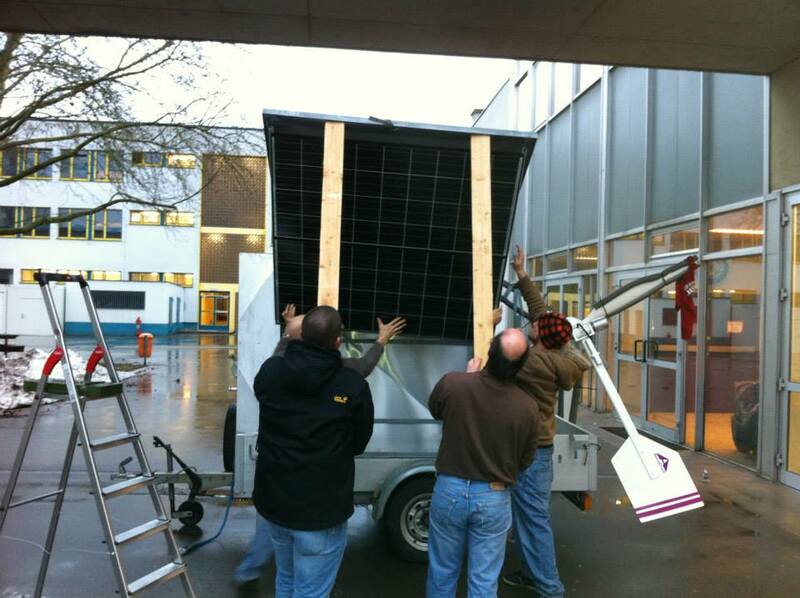 The body shell allowed the mobile wind turbine to be fitted with a second energy source and so in 2011 a 260W photovoltaic system was added. The effect was that the system as a whole now also acted as a mobile energy unit, allowing the environmentally friendly energy sources of both the wind and the sun to be drawn on and the generated energy to be stored in batteries. The increased energy intake meant that the operating period of the measuring device was further prolonged. In 2011, an air compressor was also converted so as to make it suitable for connecting to the 24V battery. This air compressor is used to extend the telescopic mast and to keep the air pressure constant inside the mast. Throughout the 2010-2012 academic years, with the help of the mobile wind power station, various locations were assessed with regard to their wind yield. This was carried out in collaboration with the University of Luxembourg and gave three students the opportunity to produce student research projects or final dissertations in this context. 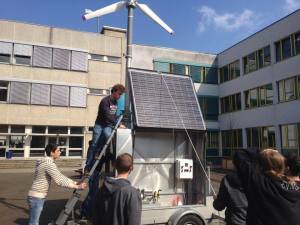 During the 2012/2013 academic year, a new measuring device and on-board power supply for the mobile wind power station were developed and installed. Measuring board to record currents and voltages. National Instruments DAQ NI USB-6211 data acquisition system for processing the measured values. Industrial PC featuring 17” touchscreen for storing and displaying data. Weather station for recording meteorological data. 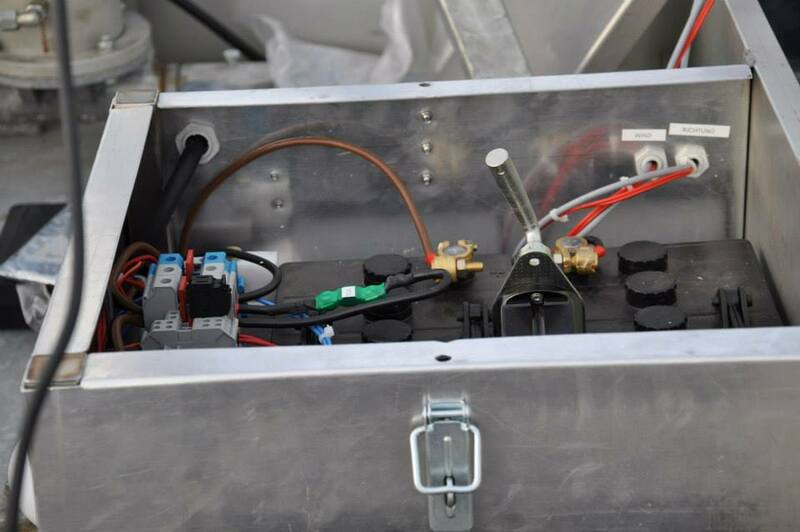 The on-board power supply was modified so that both energy sources (wind, sun) feed a 24V direct voltage network, consisting of batteries. The present (Feb 2016) version of the mobile wind turbine can be used both to measure energy yield and as an autonomous energy network. 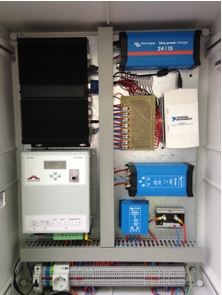 upgrade of the weather station with a solar-powered power supply.